Grand Valley Window Coverings is a family owned, locally operated, custom window treatment provider. Based in Peoria, AZ, we supply our clients with custom blinds, shades, shutters, and sunscreens. Our family business is proud to feature the full line of Hunter Douglas, Graber, Norman, and Horizons Window Fashions, which are custom crafted in North America and backed with lifetime guarantees. OUR 110% PRICE MATCH GUARANTEE Don't forget that we guarantee all of our prices! We are so confident that we provide the best value in the valley that we back it up with our 110% price guarantee. If you find a lower price for the same goods and services and would still like to work with us, let us earn your business. Not only will we match that price, we'll beat the difference by 10%! Abbey’s Windows & More has been serving Arizona with a full line of window coverings since 1993. We offer the full line of Hunter Douglas products including shutters, shades and blinds in addition to custom draperies, valances and bedding. Product knowledge, expert installation, meticulous attention to detail and a most competitive price are what separate Abbey’s Windows & More from its competitors. Abbey’s Windows & More provides the classic charm of high-quality window shades, blinds, shutters, drapes, valances, drapery hardware and other window treatments. These durable, functional and practical window coverings give you control over privacy and lighting, while adding a dynamic element to your interior décor. We are a Hunter Douglas dealer, but we also carry other brand names. Whether you’re looking for custom hardwood shutters, elegant drapery or basic mini blinds, Abbey’s Windows & More is the one company for all your window covering needs. Our goal is to provide excellent service with a style that is all your own. 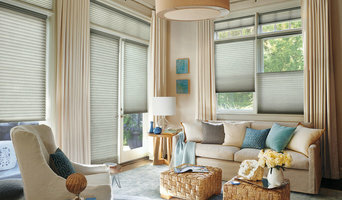 *Hunter Douglas Authorized Dealer* Carefree Coverings is your window fashion experts. We are your one-stop source for all window covering needs. We offer a large selection of custom Hunter Douglas window treatments, including sheers and shadings, honeycomb shades, shutters, horizontal blinds, vertical blinds Our distinctive services are all provided with a local flair since we're independently owned and operated. It's not often that you get the opportunity to work with a company who has as much passion for your designs as you do. Give us a call today to get started. Our team of experienced professionals awaits you. Count on us to coordinate your decorating project from start to finish. 10 BLINDS FOR $699. Mention Houzz! Phoenix Beautiful Window Coverings - Visit Our Showroom Today! Professional fabrication methods are used on all our work. AZ Draperies and Pillows is a Custom Drapery Workroom privately owned. We manage every detail of your project starting with an In-home consultation. We bring the showroom to your home: fabric books, trims, hardware samples. During the consultation we design and select the fabrics and hardware that will work with your décor. We take pride in our business and every client is important to us. At our Studio, our team oversees every step of the process from design to fabrication, and we are qualified to assist you with the simplest to the most complex residential or commercial window covering and decorating needs. WINNER 2017 VISION Design Award - Specialty Windows Amy Wolff, C.I.D. is an award winning Scottsdale interior designer, decorator, and fine custom window treatments specialist. 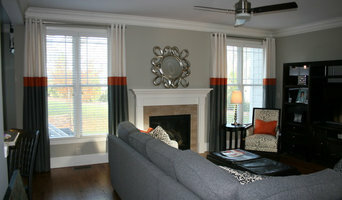 Amy is the only local professional who offers clients her unique "Photo Vision" window treatment designs – whereby illustrations of custom window treatment options are done to scale on photos of the clients’ own windows. This provides clients an extraordinary level of confidence in their design and fabric selections – and ensures that challenging, unique window designs will actually function properly and provide the designer look that is expected. Amy was the first Scottsdale designer to offer a transparent, all-inclusive, Flat Fee System for her interior design projects. This assures Amy’s clients that all project elements have been clearly defined and provides time savings and exceptional value to every project. • Interior Design and Decorating Consultations • Custom Window Treatments & Bedding Ensembles • Kitchen & Bath Materials Selections • Home Furnishings, Accessories & Art Sourcing •Outdoor “Room” Decorating Design Philosophy Amy’s interior design philosophy is simple… Every client should have fun! Every space must function well. Every room must provide comfort. Fun - A professionally decorated space should bring you joy! Think about the pleasure you feel when you are in one of your favorite places. And the process of creating that space should be fun, too! Function - A well designed room must function properly to suit your lifestyle. Whether it’s a kitchen, bedroom, or family room, we must consider traffic flow, ample seating, easy storage, proper lighting, etc. It doesn’t matter how beautiful a room is if it doesn’t function well. Comfort - Comfort is essential! This is your home…a place of warmth, safety, and wellbeing. For some, it means that the doggies can lay on anything they want…for others, a more formal, luxurious, and orderly look provide contentment. Amy will get to know what gives you the most comfort. Visit Our Trade Professionals Showroom! Since its founding, we at Budget Blinds Serving West Valley have proudly served the local community by offering high quality and stylish window coverings for any occasion. Our goal is simple: to provide you with the best products and services in order to enrich your home environment. Our lavish selection of window treatments includes shutters, blinds, draperies, shades and even window film. Regardless of the window’s size or shape, you can rest assured Budget Blinds Serving Goodyear will have a customized window coverings solution ready for you. Call us today to schedule your free in-home consultation. We’ll bring you the highest quality and most fashionable window coverings in Goodyear and surrounding areas. Looking forward to helping you beautify your home! 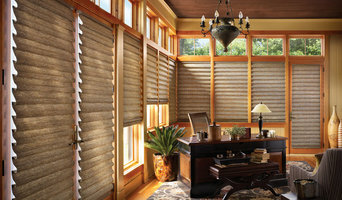 *Hunter Douglas Authorized Dealer* Blinds Up has been a family-owned business since 1980. We offer a wide selection of window treatments from Hunter Douglas, such as blinds, shades, sheer shadings, shutters, and motorization options. Since coming to the Arizona in 1986, we have established our blind and window covering business by working with great customers and vendors. Blinds Up uses only quality window covering companies that will stand behind their products. We have found that our customers trust us to take on their window covering projects, as well as repairs and installation. We are your premier Hunter Douglas dealer in the Phoenix/Scottsdale area offer custom blinds, shades, sheer shadings, shutters, and motorization options. We offer professional in-home consultations, as well as measuring, installation, and repairs services. Contact us today for an appointment! Premier to-the-trade custom window treatment fabrication workroom in Scottsdale Arizona. Fueled by creative passion, customer service, and extensive experience in the industry, Window Dressers Custom Drapery Workroom was created by Deland & Fran Pelto. Window Dressers represents the second and third generation of their family-owned businesses in the window fashion industry. Since the mid 1970"s Deland has been adorning windows with meticulous detail and a particular eye for luxury. By the early 80's he began rendering service to fine interior designers and has been known as "The (window treatment) Designer to the Designers". He has earned the reputation from his colleagues as being one of the best in the industry, not only for the high level of custom work he provides, but also the extraordinary standard of service and expertise that he brings to every project. Window Dressers has been cooperatively working with the finest team of interior designers for over three decades. You're invited to consider Window Dressers for your next window treatment project. Your Custom Window Fashion Experts of Phoenix! Phoenix Window Treatment Design & Solutions | Best of Houzz 2018! Since its founding, we at Budget Blinds Serving Tempe, Arcadia, Central Phoenix, Ahwatukee & North Chandler have proudly served the local community by offering high quality and stylish window coverings for any occasion. Our goal is simple: to provide you with the best products and services in order to enrich your home environment. Our lavish selection of window treatments includes shutters, blinds, draperies, shades and even window film. Regardless of the window’s size or shape, you can rest assured Budget Blinds will have a customized window coverings solution ready for you. Call us today to schedule your free in-home consultation. We’ll bring you the highest quality and most fashionable window coverings and are looking forward to helping you beautify your home! Adding Window Treatments to your windows and doors is a very rewarding task. The results of excellent craftsmanship will turn your home into the living space you have always dreamed of. When you choose custom designed draperies, roman shades, cornices, valances or any of the many other decorative possibilities to enhance the look of your rooms, you will notice them become more inviting, more welcoming. All crafted with precision in our own workroom, quality from start to finish. We take great pride in our in-house production. We are a SOMFI- Authorized dealer. Window treatments also help keeping the heat or the cold out and protect valuable furniture and rugs from fading. Sun blocking rolling screens can also be installed. Just ask us for an estimate, we will be glad to visit with you for a free in-home consultation!